Making a design interesting can be a significant challenge for designers, particularly when working in a well-established field where most of the obvious approaches have already been tried. making the design difficult or impossible to parse. The companion article to this one examines ways of making a design novel. This article looks at ways of making a design interesting by making it difficult or impossible to parse. I’ll start with some concepts from everyday language that will make more sense of what is meant by parsing a design. Ambiguity is something that occurs commonly in everyday life. Usually it occurs as verbal ambiguity, when a phrase or sentence can be understood in two different ways. An example is the phrase “old men and women” which can be understood either as “old men and old women” or as “women, and old men”. In that example, it’s clear what the two meanings are, and why they’re different. This is what makes ambiguity different from vagueness, where there isn’t any clear meaning. On a related note, the term “ambiguity” is technically used for cases where there are two (and only two) possible interpretations. When there are more than two possible interpretations, this is technically known as “polysemy”. For simplicity, I’ll focus on ambiguity in this article, but the same principles apply to polysemy. The term “parsing” is used in traditional grammar to describe the process that we use to identify the underlying structure(s) of a particular phrase or sentence. In the example above, we can parse “old men and women” into either “old men and old women” or into “women, and old men”. We do a very similar type of parsing when we look at a scene. Objects and scenes can be ambiguous, just as sentences and phrases can be ambiguous, and we need to parse a scene to make sense of it. Here’s a classic example. 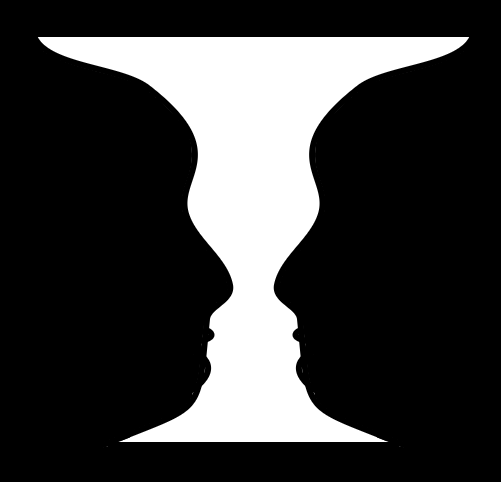 This image can be parsed either as two black faces in profile looking at each other, or as a white vase. Both parsings make complete sense of all the information in the picture, but they are very different interpretations. A famous example of ambiguous images is the Necker cube; I blogged about this in an earlier article. The Necker cube can be parsed in either of two ways. The image below shows a wire mesh Necker cube in the centre, flanked by the two ways in which the wire mesh cube can be parsed. When we parse a scene or image such as the wire mesh cube above, the parsing goes through two main stages. The first stage is risk assessment; the second is working out the detail of what we’re seeing. I’ll unpack the first stage, since it has implications that reach further than might be expected. The risk assessment process is swift and automatic. Usually the result is unambiguous – either there is a visible risk, or there isn’t. Sometimes, however, the scene is ambiguous, and may be either threatening or safe. Sometimes, we only see the ambiguity belatedly, when we realise that there’s a second parsing that we’d failed to spot earlier. This process is deeply involved in humour and in mental shock. In humour, we suddenly see that the correct parsing of a scene is completely different from the parsing that we were previously using, and we see that the correct parsing is non-threatening. Our usual response is to laugh in relief. In mental shock, the opposite occurs; we suddenly see that the correct parsing of a scene is very different, and that it’s threatening. The usual response at this point is somewhere between a gasp and a scream. The implications are far-reaching. When human beings encounter ambiguity, there’s subconscious cognitive pressure to find the correct parsing for the ambiguity; when human beings find a correct and non-threatening parsing, they get a pleasurable feeling of relief and completion. This is exactly what a lot of popular games involve. Games such as Sudoku and crosswords involve finding solutions to problems that have multiple possible interpretations, all of which we know in advance to be non-threatening. Similarly, scriptwriters often use ambiguity as an explicit plot device to heighten tension, where they set up a situation with two very different, but equally plausible, ways of parsing the facts. A classic example involves the protagonist in a thriller having to decide whose version of events is the truth. Although this concept is well known in some fields, it’s received less attention in others. In this article, I’ll focus on the implications for design of visual products, including art and buildings. When humans see something, their brain automatically tries to make sense of it. Making sense of a scene is a complex, multi-layered process, much of which occurs subconsciously. It’s a process that draws heavily on memory and on knowledge of the world. It uses a lot of rules of thumb – heuristics – to work out what is probably happening. Because heuristics aren’t guaranteed to find the correct answer, as opposed to a fast and likely answer, the process sometimes goes wrong, usually in the direction of what’s most familiar. Here are a couple of examples, relating to the pair of images below. The image on the left – the Necker cube – could potentially be parsed as a drawing of several polygons and triangles on a flat surface. However, because most people are familiar with how artists and designers draw three dimensional objects, and because the cube is a familiar shape, most people will automatically parse the image as a drawing of a cube. That’s when the problem starts, because there are two different acceptable ways of parsing the cube, and those two ways are mutually exclusive, and there’s no definitive way of telling which one should be treated as correct. The result is that the human visual system keeps niggling away at the problem, trying to resolve something that can’t be resolved. The image on the right is a very different proposition. It’s an impossible cube – in other words, at first glance it looks like a cube, but when the human visual system tries to work out which components go where within the cube, it very quickly hits problems. There’s simply no way that those components can fit together in that configuration unless one of our core assumptions about the world is somehow wrong. So, the Necker cube causes problems for the visual system because there are two solutions with no way of choosing definitively between them, whereas the impossible cube causes problems for the visual system because there’s no solution unless we significantly re-work our assumptions about the world. Second, if it’s not taken into account, it can cause unintended problems to people who have to interact with a design. Architects and artists have long been familiar with the concept of trompe l’oeil, which translates roughly as “deceiving the eye”. Sometimes this takes the form of an image that can be mistaken for something else – for instance, a fresco painting that looks like a window with a view over a landscape. Sometimes, though, the design isn’t really about deception, but is instead about ambiguous or impossible parsings. 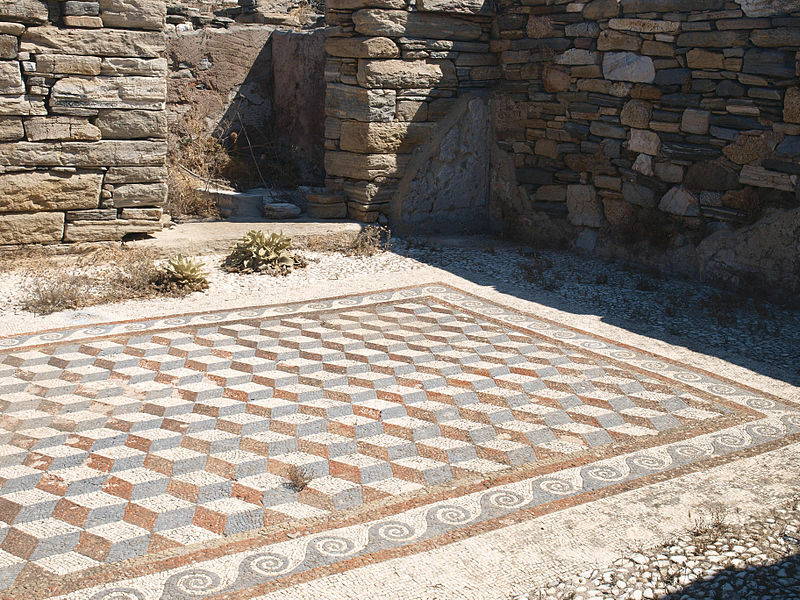 The image at the start of this article shows a widely used floor design that looks like a series of cubes, although the floor is actually flat. Even with all the visual cues from the surroundings, and from the plant growing on the floor, the parsing of the image as a series of three dimensional cubes is still compelling. Why should anyone bother to do this? Well, for one thing, it’s not a design that people encounter frequently, so it adds novelty and therefore interest to a design. That’s useful with regard to people who don’t meet this design often. However, it has the further bonus that because it’s visually ambiguous and impossible to parse, it will continue to be interesting even to people who meet it frequently, such as people who live or work in the building. Although this is a useful design concept, it needs to be used with care. There are two main reasons. One reason is that this type of visual ambiguity works in a very similar way to jokes, where a key point is the switch from one interpretation to another. Having to encounter the same visual ambiguity day after day can easily become as irritating as having to hear the same joke day after day. That’s the end of this article. Another article in this series discusses a widely-used way of making a design ambiguous in terms of parsing. It’s about skeuomorphs – in other words, products that are deliberately designed to look like something else. These can cause significant problems in terms of confusing users, and of causing structural problems for the design. At some point, I’ll also put up an article about designs that are deliberately vague, in relation to parsing, with particular regard to art. If you’re interested in impossible shapes, then you might like these sites. This entry was posted in aesthetics, art, design, metalanguage, pattern matching, useful concepts and tagged ambiguity, architecture, deep structure, escher, necker shift, parsing by hydeandrugg. Bookmark the permalink.